Okay, so I'm going to be honest and admit that this wasn't actually her first real taste of food. I let her lick my spoon at Red Mango (natural yogurt) and let her lick the ice cream off the spoon at EZ's once. Neither of those REALLY counted as eating, but in the interest of full, honest disclosure I thought I should just get them out there on the table. Can you tell this is the third baby? Last time I would have NEVER done anything that wasn't expressly permitted/recommended by the American Association of Pediatrics, and this time I rarely, if ever pick up the baby books. I cannot, CANNOT believe this baby is already almost half a year old!! It feels like only yesterday we were bringing her tiny (okay, not THAT tiny) self home from the hospital and settling into a "Party of Five" routine. Five months has FLOWN by, and I am torn between wanting time to stop indefinitely and hurry up and get past the phase where I have to have plastic swings and bouncy seats in my living room. She makes ADORABLE noises, and loves to be talked to. She still loves me best, although I am not deluded into thinking this is for any other reason than that I am her "milk truck" as Shawn puts it. She is clearly a genius: the smartest baby that ever lived. :) She fusses when she is tired, and goes to sleep easier if the room is noisy. Turn on the vacuum and that baby is OUT in a few minutes flat. She sometimes gets so busy smiling at me that she forgets she's nursing, which is hilarious. She claws all over me while she's nursing, and "makes biscuits" (like a cat)...which sometimes makes for some painful feeding sessions. She can sit up for a few seconds on her own, and LOVES the doorway jumper and the exersaucer. (thanks, Nat!) She loves taking a bath with me rather than getting one in the sink, which works fine for us because frankly sister is too big to fit in the sink! The babies seem to like her....Cale more than Hayden. He will pile her little baby toys around her if she fusses, or cover her if she kicks her blanket off. He talks so sweetly to her when he thinks no one is listening. Hayden is another story. She either baby talks to Livi and wants to kiss on her, or tells me, "I'm going to smack her. I'm going to stomp her." which I hope doesn't indicate some kind of Manson-ian problem. I try to remember the twins are just babies, and having a newbie at home isn't easy. It's hard to remember how tiny they are because they talk so well....I forget they aren't even three yet. So far, they have been sweet to the baby (with the exception of some verbal threats) and she loves to watch what they do....the louder and crazier they are, the more interested she is. She is about to try rice cereal, which I hope will help her make it longer at night. She pulls her little knees up under her tummy when she's laying down, and if I didn't know better, I would think she was getting ready to crawl already. I am loving this phase because she is all about interaction now, but I can't help but miss the tiny bird phase a little, too. A set of six magnets fits perfectly in these adorable tin boxes (again, Michael's...meant for gift cards, I think....they were at the checkout). And voila! Stocking stuffers for people who like my kids!! Everytime I think I'm done decorating for the holidays, I find another cute idea online and I have to go attempt it. Add that to the the fact that Bubby thinks he can remove ornaments from the tree and place them all over my home in inconvenient locations. (Kelly says it's because he helped decorate it...he thinks he has free license to do whatever he wants with the ornaments!) At least Sissy seems to be uninterested in the tree. She still remains concerned about Santa coming to her house. Twice, she has told me, "I don't want it to be Christmas. I want it to be Halloween." (which proves Shawn is her father, for any of you who might have been wondering.) My mom and I took her to Bracken for the little Dicken's Christmas thing, and we encountered Santa on one of the walkways there. The minute she saw him, her arms went up and I heard "Hold me, Mommy!" She let me stand next to him holding her while Mimi took our picture. She wouldn't get any closer to him, and didn't want to talk to him...until we were about ten feet away she hollered "A KITCHEN!" at him, just to make sure he knew what she wanted. Again in the mall, she saw Santa sitting in front of Picture People, and she said "A kitchen." at him again. She's not sure she likes him, but she wants him to know about that kitchen! Bubby claims he wants a kitchen, too....and I'm sure he'll enjoy it, but sometimes I think he is just sucked into the gravitational pull that is Sissy, and ends up liking stuff she likes. He isn't as terrified of Santa as she is, but we'll see how he REALLY does when we see Santa this Friday at a Christmas party. He keeps talking big, like he's going to sit on his lap but I'm interested to see how that turns out. As we wait for Christmas, we're enjoying driving around looking at lights (including the ones on our own house...the babies say "Thank you Daddy!" every time we drive home and see them) singing Christmas carols, continuing to talk about those less fortunate. After being told it wasn't nice to holler "You don't have a family!" at people, Hayden has changed her tune and now yells, "YOU HAVE EVERYTHING YOU LIKE!" Yesterday I heard Bub in the car telling her, "It's not nice to tell me I don't have a family." Sigh. The things that twins inflict on each other. A singleton wouldn't have to worry about what these two do, but they probably don't have half as much fun either. We've hit two fun Christmas parties so far...the pictures above are from my mom's church Christmas party where Bub laid on the stage during the presentation, and from Shawn's work party where Sissy spent half her time there breakin' it down Flashdance style on the stage. I added the picture of the girls in matching jammies so that my readers would know that Livi still lives here. More on her later....she's been doing SO many new things and seems like such a big girl already! At least she's not pulling ornaments off trees or screaming at Santa this year. I've been busy.....which is so sad because this house is a disaster. I have definitely been neglecting other household duties, but I can't help myself! 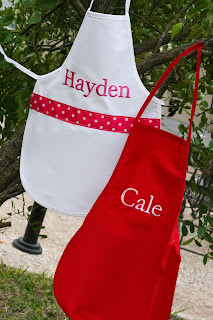 The aprons are a result of my trying to come up with homemade gifts the kiddos would like. The shirts are just because I wanted them to have something cute to wear the next few weeks that was "Christmassy". This is really outside of my comfort zone, because I am usually not a "theme" clothing kinda girl. 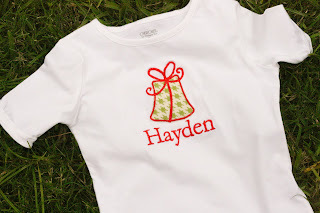 Can't see making a cute shirt that they can only wear three times....and let's be honest, the laundry sits around long enough that sometimes that cute little themed shirt might get worn ONCE (hot off the sewing machine) never to be seen again. Plus, you can't exactly hand down a monogrammed shirt! I also made a cute little crayon roll for Hayden, and I'm working on Cale's right now. 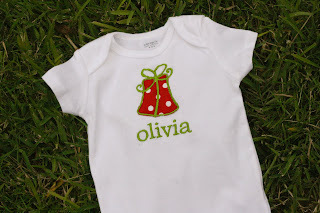 I think these are really cute stocking stuffers, and might make a few for some other kiddos I know. You can find the tutorial here if you want to make one too! There are lots of other handmade ideas on this cute site (It's called Skip to My Lou) I cracked up laughing when perusing her site, because one of the craft ideas is for a "Duct Tape Bullwhip" which sounds REALLY, REALLY fun for a little boy, but like a NIGHTMARE for his mother and sister. I'm not THAT fun.